From last couple of the days I have seen some questions around how SAP solution manager work with Managed system. I am writing couple of blogs to explain how SAP solution manager work with other systems such as ABAP, JAVA , Dual Stack and systems such as BusinessObjects and Data Services. Lets start with ABAP system for now. As you can see in picture below I am trying to explain connectivity between ABAP managed system and system data flow for configuration. Install SAP Diagnostic Agent in your Managed system. 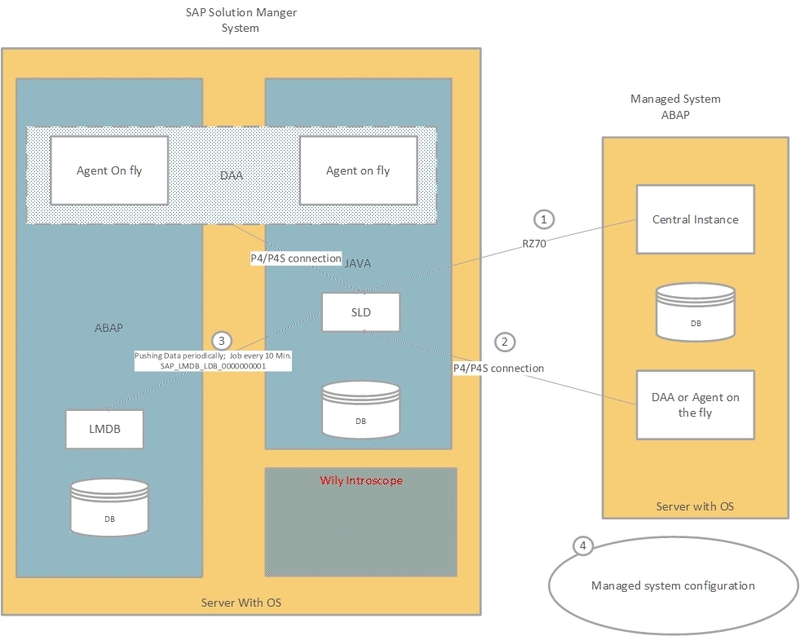 When you install DAA you need to register DAA in to SLD and connect it to SAP solution manager through P4 or P4S port. Once you have DAA installed you need to update agent through Agent Admin and trust is. Config URL will be : https://host:port/smd/AgentAdminNote: If you have to configure Agent on fly make sure you configure Host first to enable agent on fly. In all steps above I have tried to explain how your system data get pushed to SAP solution Manager and this is almost same for all the systems including JAVA and Dual Stack systems. Pushing DATA of JAVA system is little challenging and I will explain it to my next document. As you see in screenshot we have Wily Introscope and its not in use for ABAP system. Wily is collecting JAVA system data and solution manager is utilizing that data to generate EWA and for system monitoring etc. Could you please explain how can we register DAA to SLD through P4 or P4S port and what is difference between P4 and P4S port. Could you please share the document to configure DAA for SAP Java system in dual stack system ? Still waiting for ITSM, CHARM,BPM and other ALM configuration. Can I provide you with my email address to send to me if you have done it? If all managed systems of solman are abap systems then basically do not need Wily? Does not having wily in all-abap-managed-system envirionment will impact creationg of EWA reports? 1.In RCA, monitoring and alerting infrastructure, also no need for wily in same case of only abab systems as managed systems? 2. What about java stack in solman itself? if there is need for ewa report or monitoring for java stack in solman itself then we need wily? Can you please let me know why do not want to install wily? Its part of solman and better to have it rather finding exceptions not to install. System configuration will be incomplete if you have no wily. But heap size for wily takes almost 13GB as we have many managed systems. My boss wants to get rid of wily, if it is not essential. Thus I want to know about pros and cons not having wily in a landscape where there is no Java system.